Green Lake Pathway of Lights, Dec. 8; SAM Lights, Dec. 13; Woodland Park Zoo WildLights, through Jan. 5; Zoolights, Point Defiance Zoo & Aquarium, through Jan. 6. Green Lake Pathway of Lights, one of Seattle’s favorite holiday traditions, brightens the 2.8-mile path around the lake with luminaria and holiday music on Saturday, Dec. 8. The annual event draws thousands of neighbors and visitors, and everyone is encouraged to bring their own lights and candles to brighten the night. Local musicians perform at four sites along the lake, and, for the second year in a row, hot-air balloons are scheduled to be on display from 4:30 to 5:30 p.m., weather permitting. Nonperishable food bank donations are encouraged, with several donations bins on-site. Warm drinks and treats will be available. Olympic Sculpture Park will glow with luminaria and lights on its iconic sculptures at the annual SAM Lights event on Thursday, Dec. 13. Light-inspired attire is suggested for the evening, which includes a DJ, art activities for kids, warm beverages and food trucks. Garage parking isn’t available during the event and street parking is very limited in the area, so public transportation is suggested. The all-ages event is free, with online RSVP suggested but not required. 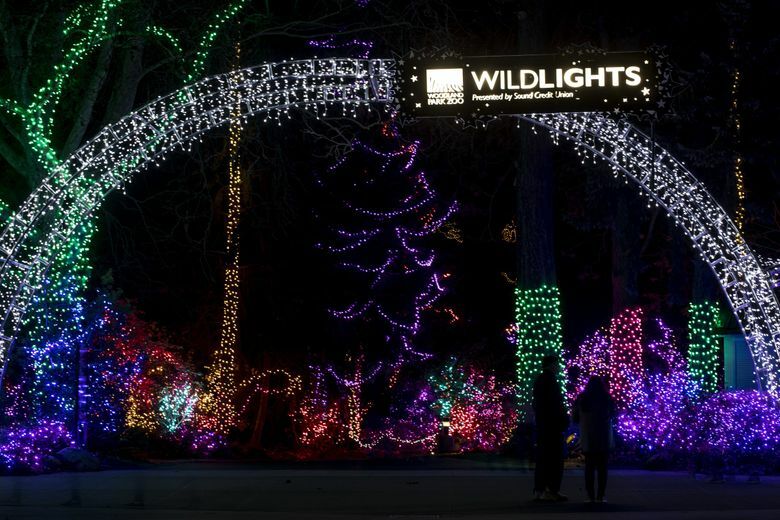 Light events through the season include Woodland Park Zoo WildLights, light sculptures of wild animals and wild places in two and three dimensions along the zoo’s pathways and North Meadow. The nightly event — which runs through Jan. 5 (closed Dec. 12, 24 and 25) — includes indoor faux-snowball play in the Snowmazium, carousel rides, and select zoo creatures taking center stage at the Alvord Broadleaf Theater each evening. Food vendors, firepits and a covered space with adult beverages are open daily. Most zoo animals are tucked in for the night, but the Day Exhibit of reptiles and amphibians and the Adaptations Building with meerkats and nocturnal animals are open during the event. Zoolights, a longtime tradition at Tacoma’s Point Defiance Zoo and Aquarium, features light sculptures of animals and Northwest landmarks, camel rides, a vintage carousel, and drinks and treats at the cafe and kiosks throughout the zoo. The South Pacific Aquarium sharks exhibit is open for Zoolights, along with a few animal displays. The event runs every night through Jan. 6 (closed only on Dec. 24).